From cities and towns near and far – individuals, communities and organizations came together for the first-ever Pop Tab Week in Rochester, MN from July 10-14, 2017. The collection and recycling of pop tabs generates between $10,000-15,000 for the Ronald McDonald House of Rochester, MN each year. Pop tab donations can be dropped off at the Ronald McDonald House seven days per week at 850 Second St. SW Rochester, MN 55902. If you collect cans as well, be sure to stop by our next Cans for Kids Collection Day on Saturday, October 7, 2017! Thank you to everyone who participated in Pop Tab Week! We are overwhelmed with gratitude. Learn more about Pop Tab Week at the Ronald McDonald House below. On Monday, July 10, we kicked off Pop Tab Week in Rochester, MN by welcoming Seth Bayles and his family to a press conference at the House. The Bayles traveled from Bristol, Wisconsin with a U-Haul full of tabs for the House. 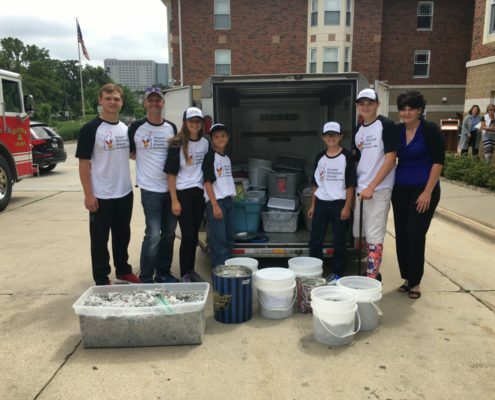 Seth set a goal of collecting one million pop tabs from his community and network – not only did Seth meet this goal, but he exceeded it! The final tally on his collection was over 1.6 million pop tabs in total! After being escorted to the House by the Rochester Fire Department, the Bayles were welcomed by media and Mayor Ardell Brede for a press conference where the mayor introduced the family and declared the week Pop Tab Week through a proclamation. Media coverage from the event can be found here. On Thursday, July 13, 2017, Ronald McDonald House staff were invited to join the Rochester International Airport at Rochester’s Thursdays on First & 3rd to promote the House’s mission and Pop Tab Week. Staff passed out pop tab houses for collections and spoke on stage about the benefits of collecting pop tabs. Staff will again be at Thursdays on First & 3rd this Thursday, July 20 with Bremer Bank near the Bremer Bank stage passing out pop tab houses and information for those interested in collecting. Be sure to stop by and say hello! 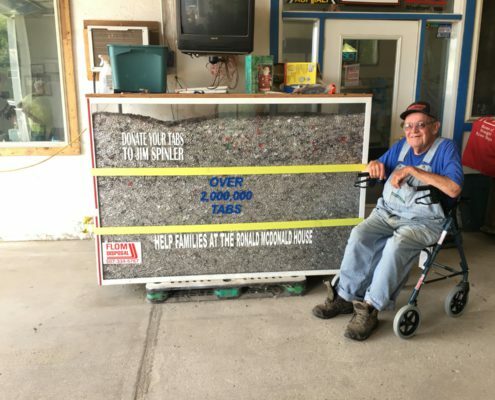 The Ronald McDonald House team recently met Medford, MN local Jim Spinler who has been collecting pop tabs for the past 30 years for the Ronald McDonald House of Rochester, MN. Inspired by a story he heard of a child staying at the House, Jim decided to begin collecting the tabs of cans he collected. Jim’s goal is to fill the plexiglas container he’s been collecting the pop tabs in before he donates to the House. To learn how you can contribute to Jim’s collection, read this article by the Owatonna People’s Press.